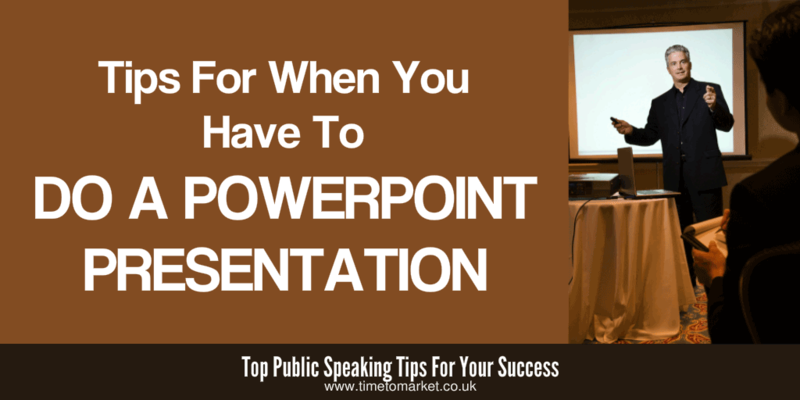 You need to do a PowerPoint presentation, and you want to get it right. So, before you dive straight in there are some presentation tips that could be useful before you do the presentation. Here are five easy PowerPoint presentation tips showing you how to do your next PowerPoint presentation. Reference the points on the slides. Pause. Then, indicate the point, look back to your audience and make the reference. Because, when you do this, you join up your talk with your slide show. And, of course, you help your audience to digest the main points. Use the slide build technique…an under-used PowerPoint jewel. Since, with a build you can reference a point on the display screen, you can ask an open question, pause and then display an answer on the screen. This could be a word build or a graph display. Yes, the options are limitless. You can always access all the settings via the Slide Show, Animation Scheme settings in PowerPoint. But, take care that the technology doesn’t take over. Use the black slide technique. You will need to take stock during a presentation—to confirm where you are or the direction you are going. You need your audience’s total focus…no distracting slide on the screen. Try to use a black slide (Format, Background, Colors, Apply to Selected). The black slide gives the impression that you have switched off the projector. Your audience’s attention switches to you. With the point made you can continue. Top tips showing you how to do a PowerPoint presentation. Reference the points on your PowerPoint slides. Use the slide build technique. Aim to use the black slide technique. Use fonts and typefaces carefully. Make sure that you use imagery well. Use fonts and font sizes carefully. PowerPoint defaults to a selected font and font size when you do a presentation. You can stick with the default or use a better option. With fonts, you need: readability and consistency. Some fonts are made for reading at a distance—others are not. Fonts can signal structure changes such as titles, sub-titles and content. But when applied indiscriminately they don’t signal anything other than a mess. You can just take a look at this Mitt Romney PowerPoint presentation to confirm the point. Take it steady with the imagery when you do a PowerPoint presentation. Slide colour schemes can affect the readability of your PowerPoint slides. Reading red or green text at a distance is tough. Plan to use dark text colours (black or blue) out of a white background if you can. Don’t overdo the whizz bang effects in the slide show menus (Slide Show, Slide Transition and Slide Show, Animation Schemes). Because PowerPoint overload is a problem, as this Kaiser audience discovered. Yes, you can do it. As we discovered in this canine PowerPoint presentation! However, a presentation skills training course at your nearest PresentPerfectTM training centre will always help when you need to do a PowerPoint presentation. So, when the time is right, please don’t hesitate to get in touch.